I'm Carolyn Pulver Burke and am the Junior Pulver Historian in the Finger Lakes Region of New York. My cousin, Jerry Pulver, is the Senior member of the "firm". 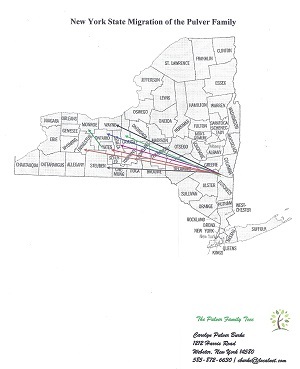 When I retired in 2008, we decided to jointly research and organize all the Pulvers in the Finger Lakes area. We have been approaching it county by county. Our family branch settled in Yates County so we did that first. Then last year we tackled Ontario, Monroe, Cayuga, Seneca, and Livingston counties (smaller populations). This year we are tackling Wayne County which was and still is the biggest population of Pulvers outside the Hudson Valley. Our database has a little over 3000 people. Jerry and I do original research at court houses and churches and we work with Pulver families to develop their family tree and expand our knowledge. I came across your website yesterday - it is fantastic!!!!! I am really impressed with the detail you have - I know it must have taken a long time and I am sure it is a labor of love. I have looked through the first three generations and the data looks fine. In a few cases, I have a baptismal date and you have the date as a birth date, but genealogy is like horseshoes - close counts!!! I don't get real hung up on dates. As long as the relationships and people are right, so be it. One small error I noticed is on Christopher b 1797 son of Henrich - for 1840 census you have him in Sodus. The fellow in Sodus is Christopher but not your Christopher. This Christopher is the son of Wendell A (Andreas>Pieter W>Johann Wilhelm). Settled in Sodus in the 1830s. Died 1847. Buried in the Lyons Rural Cemetery with his wife Sarah Ann White. The Wendell A family is fascinating because most of the boys took off to the West. Christopher and Levi went to Sodus, Wayne County. Johannes W, Henry W, Jonas C and sister Rebeccah went to Canadice, Ontario County. 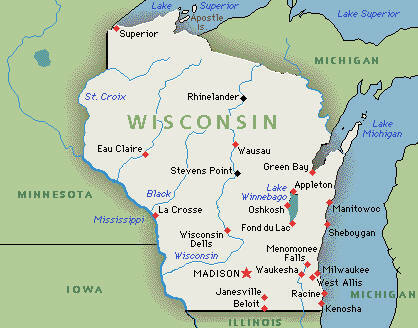 Then by 1850 census Johannes W, Jonas C, and Rebecca (and her husband) were in Wisconsin. Henry W stayed in Canadice and his descendents are still there today. I believe Johannes W's grandson, Samuel Sharpstein Pulver moved to North Dakota; grandson Seymour W went to Minnesota. Your Christopher apparently settled in Broome County. We have not tackled that county yet but we will in the future. We have set the counties along the bottom of the state aside because the people kept wandering from Pennsylvania to New York, not moving West. 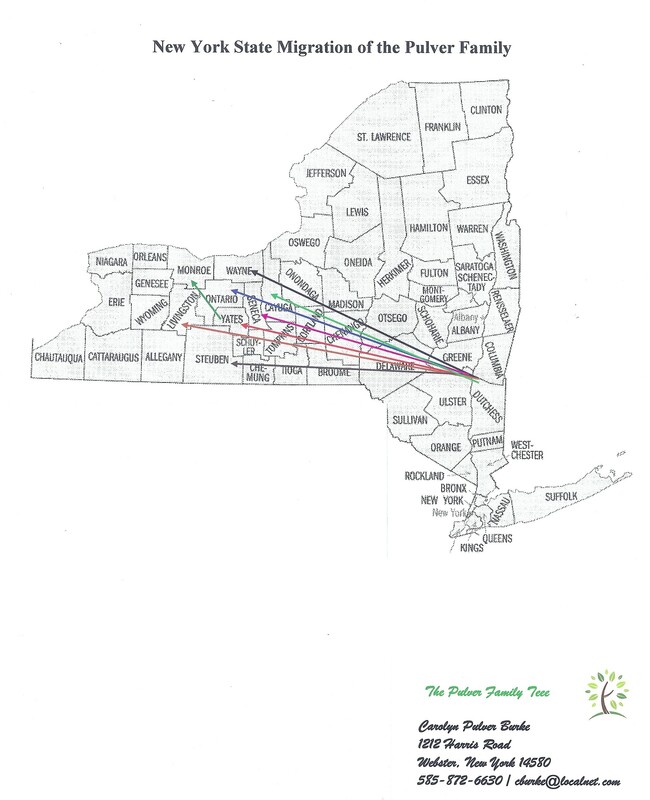 I have been trying to develop a migration chart of the Pulver branches when they leave the Hudson Valley. 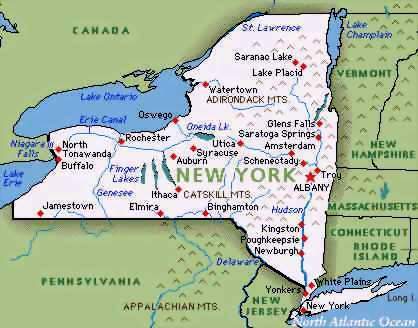 So far we have just worked on New York State. I'm attaching our research for your information. I will continue to work through your website and I will send you any thoughts. If you would like any data from my database, just let me know. I usually pull data by family branch to keep the file size manageable. The whole database report is over 200 pages long now! Nice meeting you and great job on the website - isn't genealogy addictive? Subject: RE: Pulver's Were not Jewish? Damian, Could be of Jewish decent. 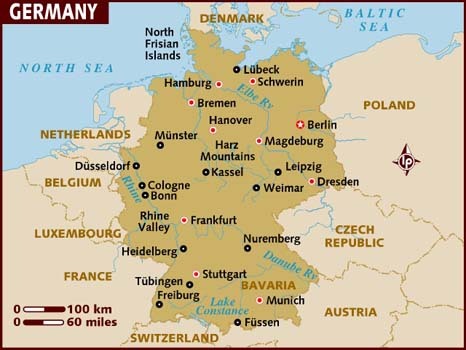 I have not been able to document back any farther then Germany / Prussia. Subject: Pulver's Were not Jewish? Hi, I' am related to the same pulver family as you, an thought they were Jewish, are you sure they were German, an not Jews living in Germany? I am hoping you can help me in my research of my 3x Great Grandfather. His name appears as the following, Edwin C, Edward C, E.C., and Captain Edwin, EC, Edward Pulver. He was born abt 1831 in West Point, Orange County, NY. He became a whaler ship captain and traveled around the world before settling in Moravia, NY. I have found info on him in dutch when googling him, which leads me to believe there were family ties to Holland. Is there anything that sounds like he fits into the family tree that you have done so beautifully? Andrew Wendell Pulver was born on 15 Jun 1731 in Rhinebeck, Dutchess Co., Ny. He doed on 14 Jun 1815 in North Chatham, Columbia Co., Ny. He was buried in Jun 1815 in Kinderhook Cem., Kinderhook, Columbia Co., He has Ancestral File Number WD7Z-DJ. Andrew Wendell Pulver and Anna Eva Linck were married on 20 Dec 1757 in Germantown, Columbia Co., Ny. Christina Pulver was christened on 23 Sep 1759 in Germantown, Columbia Co., Ny. She died before 1813. She has Ancestral File Number 21BQ-H77. She was born before 23 Sep 1759. Susannah (Rosina) Pulver was christened on 13 Jun 1761. She died on 18 Jun 1825 in Ancram, Columbia Co., Ny. She has Ancestral File Number 21BQ-FHJ. She was born before 13 Jun 1761 in Germantown, Columbia Co., Ny. She was buried in Pine Plains, Dutchess Co., Ny. Wendell A. Pulver was born between Jul and Aug 1768 in Germantown, Columbia Co., Ny. He was christended on 7 Aug 1768 in Germantown, Ny. He has Ancestral File Number 21BQ-HBT. Andrew Pulver was christed on 24 Jan 1771 in Pine Plains, Ny. He has Ancestral File Number 21BQ-HD8. He was born before 24 Jan 1771 in Pine Plains, Dutchess Co., Ny. Gertrude Pulver was christened on 24 Jan 1771 in Pine Plains, New York. She has Ancestral File Number 21BQ-HC2. She was born before 24 Jan 1771 in Pine Plains, Dutchess Co., Ny. Lena Pulver was born about 1760 in Pine Plains, Dutchess Co., Ny. She has Ancestral File Number 21BQ-H5S. Eva Pulver was born about 1762 in Pine Plains, Dutchess Co., Ny She has Ancestral File Number 21BQ-H61. Peter A. Pulver was born on 13 May 1764 in Germantown, Columbia Co., Ny. He was christened on 13 May 1764 in Germantown, Ny. He died on 20 May 1828. He has Ancestral File Number 1BCN-FXM. Catherine Caty Pulver was born on 31 Aug 1766 in Germantown, Columbia Co., Ny. She was christened on 31 Aug 1766 in Germentown, Ny. She has Ancestral File Number 1BCN-FZT. Nicholas Pulver was born about 1775 in Pine Plains, Dutchess Co., Ny. He was married to Mary (Polly) Parks on 14 Jan 1798. He has Ancestral File Number 1BCN-G3M. Mary Pulver was born about 1777 in Pine Plains, Dutchess Co., Ny. She has Ancestral File Number 1BCN-G4T. I just wanted to take the time to let you know that this is a great website on the Pulver family history. Would you have any information on Nicholas Pulver born in 1775 in Pine Plains, Dutchess Co., New York, he was the son of Andrew Wendell Pulver born 15 Jun 1731 in Rhinebeck, Dutchess Co., New York, his mother was Anna Eva Linck born 5 Mar 1737 in Columbia Co., New York. I know that Andrew Wendell Pulver was the son of Peter Pulver who was 2 years old when he left England. Nicholas Pulver was married to Molly (Polly) Sutherland Parks who was born in 1777 in Pine Plains, NY and had the following children: Lewis W. Pulver 1801, Smith Sutherland Pulver 1809 and David Pulver 1816. I was told that they also had a son John Isaac Pulver 1806? who may be my ggg grandfather who was married to Catherine Lapman/Luffman born 1818 and had 9 children one which is my gg grandfather Smith Pulver 1863 in Copake, New York. I have not been able to connect John Isaac Pulver with Nicholas Pulver and would you be able to provided any light on this or put me on the right track. Thank you for the great website and hope to hear back from you soon. Hi wanted to send you a bit more detailed information - which Im not sure you may already know yet here goes. Cassius Marcus Pulver had 2nd wife Celestia Jae Marker (married her in WI). Yet Im from Cassisu's son's line Dr. John Earl Pulver and Irene O Pulver. Their two daughters Mary and Jane. Mary the elder married someone with last name Gipper (this spelling is a guess a this point and unknown husband name). Mary had 2 children Susan and John. John Earl and Irene's youngest daughter Jane E marrried Ted Arndt and had 1 daughter Peggy Irene Arndt. Who married Robert Charles Schaefer. They had 2 children, my older brother Robert Charles born Sept 1957 in Omaha, NE (now lives in Kentucky with wife Rita, they had 3 children Robert, Jeffery and Mindy). Im Robert and Peggy's youngest child born as Theresia Ann Schaefer (referred to as Teri). Born 11.22.58 in Omaha, NE. Married my beloved Stephen Dale Cooper (born in Anderson Indiana 5.11.56; his parents George Cullum Cooper Jr. and mother Vonda Elise Hammock both born in Tennessee) we have 2 precious adult children. Scott Stephen Cooper born 8.1.82 Nashvile, TN. (now 2011living in Brooklyn, NY attended SVA in Manhatten, NY). Stephanie Ann Cooper (our baby lol) born 6.12.85 Nashville, TN.Residence is Fort Wayne, IN. moving to New York in 1 year to finish her schooling and be near brother. This is so wonderful to find our history. THANK YOU for all your hard work and sharing. HI Jay, I have found your site for the Pulver family. I note that there has not been any progress for awhile. Is this still being completed? I am also trying to track part of the Pulver Tree! My father is William Pulver, son of Alfred Clinton Pulver with Marjorie Leonard (a freelance writer) who was the son of Clinton D Pulver with Jenny Tinney. He was the son of a Alfred Pulver with a Mary Elizabeth? He was the son of Cornelius C Pulver with Eve Melius. He was the son of Michael Pulver with Elizabeth Bresee who was the son of Jacob Pulver and Maria C Bernhardt. He was the son of Johannes Wendel Pulver with Anna Christina Busch. The thing is that I cannot find anything about Cornelius C Pulver except a notation of the LDS naming him as the son of Michael Pulver? Do you have anything on this branch of the Tree? My Pulver family tree has been difficult to research. Everything I have collected is on my website. I am always researching but seem to be stuck right now. I can't seem to make any new progress on the Pulvers. was Emmett Pulver. He was born in Vernon County.He married Nellie Tubbs. emmett and oliver as children of J.W. Pulver...hoping this is a connection. Simon Seal, also of Vernon. Do you think you are related to these Pulvers? I know there were quite a few different lines in Wisconsin. Looking for any family of Wendell H. (maybe Harrison) Pulver born ca. 1793 in Schoharie County, New York. Married Oct 1821 in Cobleskill, NY to Rachel Jager or Teager. Moved first to Dutchess County, NY, then Ontario, NY and eventually to Vernon County, Wisconsin. Wendell was a wagonmaker. and Catharine Pulver married a man named Waterman. Would like to make contact with any of their descendants. I am related through John and Margaret Pulver's daughter Mary Josephine who married Simon Seal. I have good news for you. The ancestry of Wendell Pulver and Rachel Jager has been researched extensively by another descendant. I have been using that information as a guide and have trying to verify it and add sources. In brief, the parents of Wendell Harrison Pulver were Henrich Pulver and Helletje Muller who lived in Claverack, Columbia County,New York. Rachel Jager's parents were Jeremiah Jager (I have found various spellings: Jagger, Yauger) and Catharine Tidter (Teator, Teeter and others). The Jagers were originally from Columbia County but settled in Clifton Springs, Ontario, NY. I am happy to share and will e-mail you more information. The Pulvers came to America to New York in 1710; they were considered Palatines who fled Germany because of economic and religious problems to the Netherlands and were taken under the protection of England and brought to America to be colonists. There are many books written on these immigrants. The first Pulver immigrant was Johan Wilhelm or Wendell Pulver . See The Palatine Families of New York A Study of the German Immigrants who arrived in Colonial New York in 1710 written by Henry Z Jones. We are descended from Wendell Pulver's son Michael and grandson Johan Wendell and greatgrandson Heinrich who was father of Wendell Harrison Pulver. They lived in Dutchess and Columbia Counties, New York. I can send you some family group sheets if you send me your e-mail address. Orville Roscoe Pulver m. Frances Lillian Church. 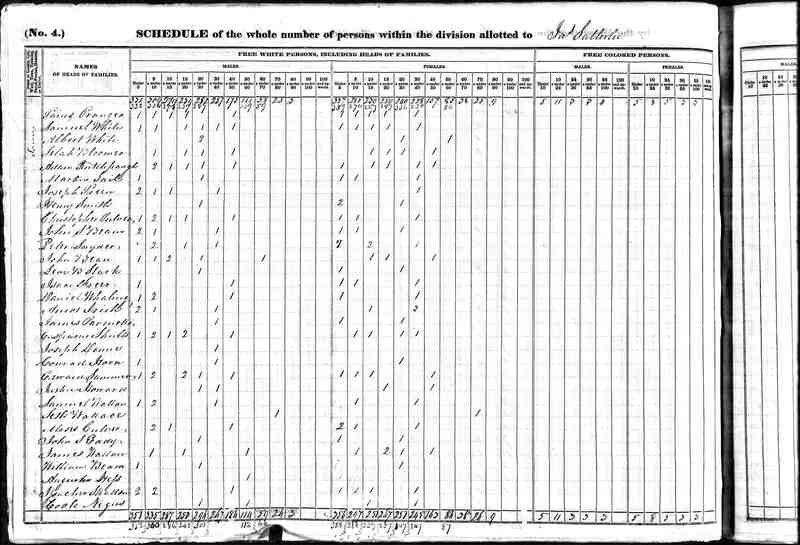 I don't know why David Henry Pulver doesn't show up in the 1860 census for Bad Ax Co., WI. Perhaps he was with a relative. I'll have to check to see if I have found him in 1870. He is living with his mother and 3 of his siblings in 1880 in Canada, Polk Co., NE. The information above was given to me by my husband's uncle who received it from another PULVER descendant who did not list sources. Let me know if you would like more information. The line goes back to Johann Wendel and Catharine Busch. Wonderful to hear from you. How exciting that you were able to visit the graves of Wendel and Rachel PULVER. My work on the PULVER genealogy is not my own (for the most part) and only recently begun. Are you familar with any of the above? From reading other messages on this Forum, I see that you descend from Mary Josephine PULVER, who, according to my records, is a sister to my husband's great-grandfather, David Henry PULVER. Does this agree with what you have found? I am happy to share the information that I have.